Emile Heskey's England goals record is under scrutiny as the shadow of Everton's Wayne Rooney looms large - and it does not bear close examination. England's fans were clear in their delight when Liverpool striker Heskey was substituted by the 17-year-old sensation in the closing stages of England's 2-0 win in Liechtenstein. And the clamour is growing almost by the hour for England coach Sven-Goran Eriksson to make the change on a permanent basis. Former England manager Sir Bobby Robson is the latest experienced football figure to insist there is no more mileage in keeping Rooney's exceptional talents under wraps. Heskey made England's opening goal for Liverpool team-mate Michael Owen - but failed to hit the target against the Euro 2004 minnows. It took Heskey's England tally to just four goals in 32 appearances, and increased the demands for Eriksson to call time on Liverpool's powerful striker and replace him with the youngster from the other side of Stanley Park. So what are the merits of the two players fighting for a place alongside Owen in England's attack? Kevin Keegan gave Heskey his England debut in Hungary in 2000. He has always been willing to serve his country in any position, either as a striker or in a more accustomed left-sided position. Heskey has been a regular under Eriksson, who is a massive admirer of the player, and has vast Premiership experience. High point came with a goal in England's historic 5-1 win in Germany. Barely any top flight experience - only made his Everton debut as a 16-year-old on the opening day of the season against Spurs. But shot to superstardom with a wonder goal against Arsenal at Goodison Park in October and was instantly fast-tracked to full England status. Heskey has pace and power in abundance, and on his day can be an intimidating figure - his day, sadly, does not come around often enough. Heskey is too often the gentle giant when the situation cries out for defenders to be roughed up. Lightning speed puts defenders on the back foot in an instant, and possesses a powerful, bullish physique way beyond his 17 years. Powerful defenders have tried to knock the teenager off the ball, and found to their cost he is not to be intimidated physically or mentally. Heskey relies more on pace and power to beat defenders, but he is not without skill and counts an ability to hold the ball up among his major qualities. Naturally gifted, with quick feet and capable of moments of unstoppable brilliance, as both Arsenal and Leeds will testify. Capable of beating defenders while running at pace, and possesses a natural awareness. Born to play and most at home on a football field. 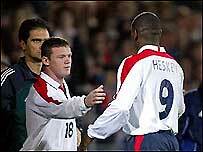 Rooney can produce moments of instinctive inspiration that are beyond most players, not just Heskey. Team-mates and managers talk in almost reverential tones about Heskey's unselfishness - indeed on occasions he is simply too unselfish. Always willing to sacrifice personal glory for the good of the team, which has occasionally brought unwarranted criticism on his head. He can be criticised for many things, but never for putting himself ahead of the team. He is ahead of Rooney in this respect. Still learning and has the occasional tendency to believe he can do it all himself, or try his luck from the most speculative of opportunities. Rooney will be working on this at club level with Everton manager David Moyes. Heskey's biggest weakness. Just doesn't score enough goals - either for club or country. He has scored only five Premiership goals this season and his England record of one every eight games is not international class. Heskey will never be a regular England goalscorer, and eventually selfless team-work alone will not be enough to save him. Rooney has been a prolific scorer at all levels, and can score the brilliant goals out of nothing that can make all the difference in the rarified air of international football. Shows all the signs of being able to hit the target frequently - he can normally be relied upon to create chances for himself in every game. Rooney is now putting fierce pressure on Heskey's place, and in an England team short on inspiration apart from Michael Owen and David Beckham, the Everton youngster should be given the nod. Sir Bobby Robson is an expert in blooding young players, and when he insists Rooney must play he will find the nation in the mood to listen. Eriksson, however, may still turn a deaf ear to the plea.